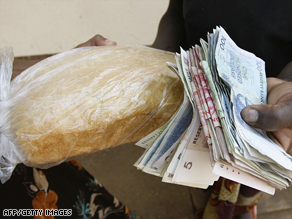 Zimbabwe's dollar is virtually worthless, with foreign currency now being used to purchase basic items. Although Chinamasa did not give the date on which the $50 billion and new $20 billion notes would come into circulation, an official at the Reserve Bank of Zimbabwe said the notes would be distributed to all banks by the end of Monday. Once a regional economic model, Zimbabwe is in the throes of an economic crisis, with unemployment running at more than 80 percent and many families unable to afford a square meal. President Robert Mugabe's critics blame his policies for the economic meltdown, but he says the West is sabotaging his efforts. John Robertson, an economist in Zimbabwe, said he's puzzled by the introduction of the $50 billion and $20 billion notes. In August, the RBZ slashed ten zeros from the currency. But the zeroes have bounced back with more vigor. A power-sharing deal between Mugabe and opposition leader Morgan Tsvangirai signed in September, and brokered by former South African leader Thabo Mbeki, raised hopes of halting Zimbabwe's plunge into economic destruction. But the pact has stalled over the allocation of key cabinet ministries, with Tsvangirai accusing Mugabe of grabbing all key posts such as defense, home affairs, local government, foreign affairs and finance.